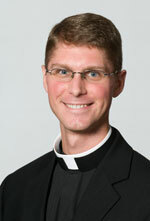 Archdiocesan seminarian Sean Danda, a member of St. Malachy Parish in Brownsburg, was among 25 American and Australian seminarians who were ordained transitional deacons by Bishop William P. Callahan, an auxiliary bishop for the Archdiocese of Milwaukee, on Oct. 9 at St. Peter’s Basilica in Rome. The bishop’s message centered on the promises of prayer, chastity and obedience made by each of the new deacons. Archdiocesan seminarians Jeremy Gries and John Hollowell, members of Nativity of Our Lord Jesus Christ Parish in Indianapolis, and Peter Marshall of St. Mary Parish in Indianapolis are scheduled to be ordained transitional deacons on Oct. 25 at the Archabbey Church of Our Lady of Einseideln in St. Meinrad. Seminarian Christopher Wadelton, a member of Immaculate Heart of Mary Parish in Indianapolis, is scheduled to be ordained a transitional deacon on Dec. 20 at Immaculate Heart of Mary Church in Indianapolis.